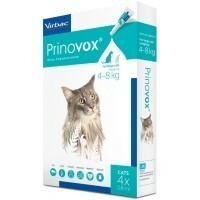 Prinovox Spot-On Solution for Large Cats is for use in large cats weighing 4-8kg. It is a broad spectrum parasiticide for the treatment and prevention of fleas, mites, roundworms and heartworms. Each 0.4ml pipette contains as active ingredients: Imidacloprid (80mg) and Moxidectin (8mg). Do not use in kittens under 9 weeks of age.